This week we review the 2015 edition of the Berlitz Cruising & Cruise Ships guide, now in its thirtieth year of publication, in a slightly slimmer version that has been trimmed back to its previous 704-page size. New this year is a number of “best in class” awards that widen the guide’s scope beyond straight ship reviews. 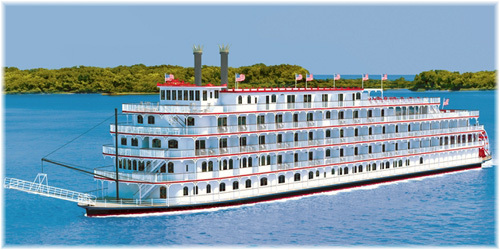 In America, while not quite a Rhine, Main and Danube cruise, American Cruise Lines’ will in 2015 introduce an extended 21-night itinerary that will cover the entire Mississippi River from New Orleans, Louisiana, to St Paul, Minnesota, using its newest riverboat, the 150-berth American Eagle. And in the Eastern Mediterranean this winter, CroisiEurope’s 200-berth coastal cruiser La Belle de l’Adriatique will offer a new series of 7-night sailings between Athens and Istanbul, which will replace the Cyprus and the Holy Land cruises that had been planned from Limassol. In its 30th year of publication the 2015 edition of Berlitz Cruising & Cruise Ships has downsized by 48 pages, from 752 pages in 2014 to 704 again. This has been done quite easily, among other things by eliminating 9 pages of maps (most people have atlases), 6 pages of river information (Berlitz now has its own river cruising guide) and 8 pages of introduction, making the guide leaner and more effective. The new slimmed-down version also contains some other changes. One is an article entitled “What’s changed in the last 30 years?” – and the answer is a lot. The size of the largest ships, for one thing, has risen fantastically, from 2,000 passengers to more than 6,000. Crowds and line-ups are more common today, at least in the largest ships. 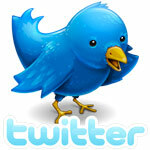 There was no Internet thirty years ago, something that has helped cruising reach larger numbers of people. Alternative dining was restricted to the occasional grill restaurant such as on Queen Elizabeth 2, while they appear in multiples today, with certain lines and ships boasting about the number of dining venues they offer. There is also much less regimentation in the way of fixed sittings for meals. There are also now 285 ships compared to 120 thirty years ago, so more to choose from, including smaller more exclusive ships. And there are many new on board attractions and much more flexibility as to how things happen on board. The 2015 edition has retained the same scoring system, but instead of the top ten in each size category, it now scores only the top five, while at the same time it has added a new series of top five “best in class” awards. 5 Best Ships for Families – Allure & Oasis of the Seas, Disney Dream & Fantasy, Mein Schiff 3, MSC Preziosa and Norwegian Breakaway & Getaway. 5 Best Cruise Lines for Teenagers – Disney Cruise Line, Norwegian Cruise Line, Princess Cruises, Royal Caribbean International and TUI Cruises. This award went only to each line’s two or three newest ships, which have the most developed teen programs. 5 Best Water Slides – Carnival Cruise Lines’ DrainPipe, Disney Cruise Line’s Aquaduck, MSC Cruises’ Vertigo, Norwegian Cruise Line’s Epic Plunge and Star Cruises’ Parthenon Slide. 5 Most Luxurious Suites – Royal Loft on Allure & Oasis of the Seas, Crystal Penthouse on Crystal Serenity, Owner’s Suite on Europa 2, Owner’s Suite on Marina & Riviera and Sandringham Suite on Queen Mary 2. 5 Best Cruise Ship Spas – Aida Cruises (AidaPrima), Cunard Line (Queen Mary 2), Hapag-Lloyd Cruises (Europa 2), MSC Cruises (MSC Fantasia, Preziosa, Splendida) and Saga Cruises (Saga Sapphire). 5 Best Ships for Child-Free Cruising – Adonia (P&C Cruises), Grande Caribe (Blount Small Ship Adventures), Island Sky (Noble Caledonia), Minerva (Swan Hellenic Cruises) and Saga Sapphire (Saga Cruises). 5 Best Cruise Lines for Foodies – Crystal Cruises, Hapag-Lloyd Cruises, Oceania Cruises, SeaDream Yacht Club and Silversea Cruises. 5 Longest Swimming Pools – Mein Schiff 3 (82 feet), Europa (57 feet), Europa 2 (46 feet), Asuka II (44 feet) and Crystal Serenity & Symphony (44 feet). And this year, as last, the world’s two best ships are Hapag-Lloyd Cruises’ Europa 2 (1860 points out of 2000) and Europa (1851 out of 2000), the only ships in the guide given a full five-stars-plus rating. Coming in number 3 for 2015 is SeaDream I with 1,760 points and five stars. 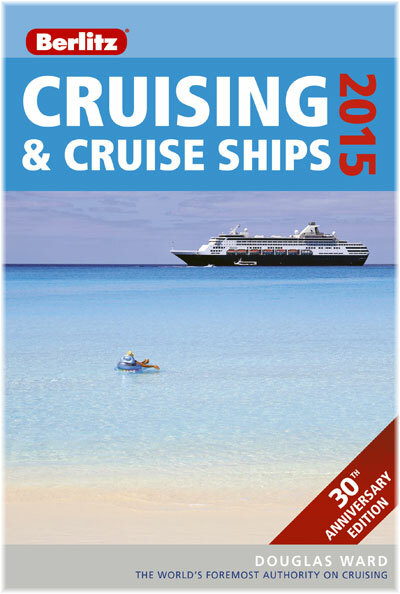 Berlitz Cruising & Cruise Ships 2015 was published on October 1 and is available at insightguides.com/berlitz/berlitz-cruising or at Amazon. American Cruise Lines last week announced that it would name its newest 150-passenger riverboat American Eagle. She is scheduled for her maiden cruise on March 28, 2015, but of most interest to itinerary watchers will be a new 21-night cruise all the way from Louisiana in the South to Minnesota in the Midwest. The sternwheeler will be similar to the Queen of the Mississippi, introduced in 2012, and was built to operate on the Mississippi and its tributaries. She will primarily operate 7-night cruises, round-trip from New Orleans and also between New Orleans and Memphis, at fares starting at $4,320 for a week. In August and September, she will offer three 7-night cruises between St Louis and St Paul, where the Queen of the Mississippi is operating at the moment. But most interesting are the two longer voyages that will cover the entire length of the Mississippi between New Orleans and St Paul. The northbound cruise will leave New Orleans August 8 and take 21 nights as American Eagle heads upriver to St. Paul, with fares from $12,180 per person. The downbound cruise will leave St Paul on September 12 and will offer a shorter 14-night itinerary, starting at $8,420 per person. The 21-night “Complete Mississippi Cruise” will visit 16 ports from the South to the Midwest, including Baton Rouge, Natchez, Memphis, St Louis and then on to Hannibal, Missouri, Davenport, Iowa; La Crosse, Wisconsin, and Red Wing, Minnesota, before reaching St Paul. The downriver 14-night “Grand Heartland Cruise” itinerary will include 12 ports of call. Although similar to the Queen of the Mississippi, there are also a few differences. Both accommodate 150 passengers, but the American Eagle will have nine new balcony staterooms on her top deck, including three singles. All balcony staterooms on American Eagle will have floor-to-ceiling sliding glass doors and she will have 19 single staterooms, all but one having a private balcony. Rooms will all have interior access, will be very spacious and will benefit from complimentary Wi-Fi internet access. The American Eagle will have six lounges and her Grand Dining Room will be able to accommodate all passengers at one open sitting, while the Top Deck Café will offer beverages, snacks and pastries throughout the day. CroisiEurope is this winter introducing Eastern Mediterranean sailings between Athens and Istanbul on its 200-berth Belgian-flag coastal cruise ship La Belle de l’Adriatique. The 7-night cruises will operate from next month through to March 2015 and will be sold in the UK market from £756 per person, cruise-only. The newly planned itinerary is Athens – Patmos – Kusadasi – Pergamon – Istanbul or vice-versa. This itinerary is a replacement for an originally-scheduled program of Cyprus and the Holy Land cruises that were planned to run Limassol – Paphos – Haifa – Larnaca – Limassol, but were cancelled because of the present political situation in Israel. La Belle de l’Adriatique was the first of what were supposed to be two coastal cruise ships built for CroisiEurope to operate under the brand CroisiMer, but the second ship was never completed. La Belle de l’Adriatique was delivered in 2007 by the Meuse & Sambre shipyard in Namur, Belgium, which has also completed twenty-four of CroisiEurope’s river cruisers, including its flagship, the 180-berth Cyrano de Bergerac, which was delivered in 2013 and cruises out of Bordeaux. CroisiEurope went all-inclusive this summer with the addition of drink taken in the bar to those that were already included with meals, the exceptions being Champagne and wines listed on the line’s wine list. Another new itinerary introduced by CroisiEurope this year is a 10-day cruise between Amsterdam and Avignon via the Rhine and Rhone Rivers. 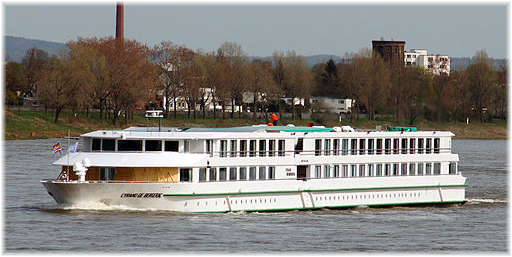 Calls are made at Dusseldorf and Cologne as well as at Strasbourg, CroisiEurope’s headquarters, and Lyon, which is a new experience for Rhine cruisers. The fourth and final of these cruises for this year finished just last week.